The Configuration Management Database or CMDB represents all your business and infrastructural components (Configuration Items) in diagram form, as well as their relationships and associated detailed information. It is a central repository for the Configuration Items your company manages, their characteristics, relations and interdependence. CMDB is at the heart of the HelpdeskAdvanced solution, mapping, organising and monitoring all applications, systems, services, resources and assets present and managed within the company infrastructure. 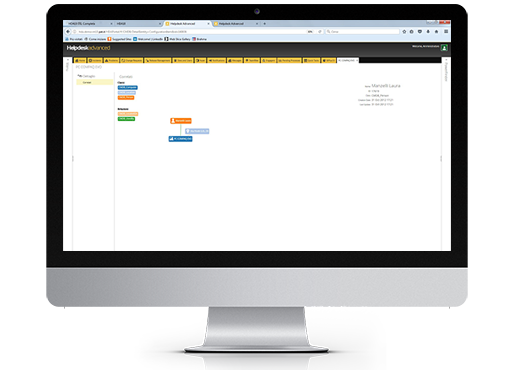 CMDB allows you to orchestrate and monitor alignment between business objectives and IT strategies. The process integrates and coordinates data and information related to all the elements within the system that HelpdeskAdvanced governs. Benefit from centralised representation of relationships between components. Resolve problems proactively, analyse service levels and measure performance. Centralise and identify all Items and trace relationships between them. Improve control and efficiency of service governance and reduce errors.